Blair Castle is located in one of the most beautiful areas of Scotland, right in the heart of picturesque Perthshire. The medieval castle lies near the village of Blair Atholl, which is named after one of the families who lived there in the past. Blair was home to the main seat of the Dukes and Counts of the Atholl clan. Blair Castle is located in Strath of Garry and occupies a strategic location as one of the main routes through the central Scottish Highlands. From here is the last and one of the shortest routes to Inverness. With nearly a 740 year history, Blair Castle was built in 1269, as evidenced by historical sources. Blair Castle opened to the public back in 1936, making it one of the first such estates in the UK to do so. 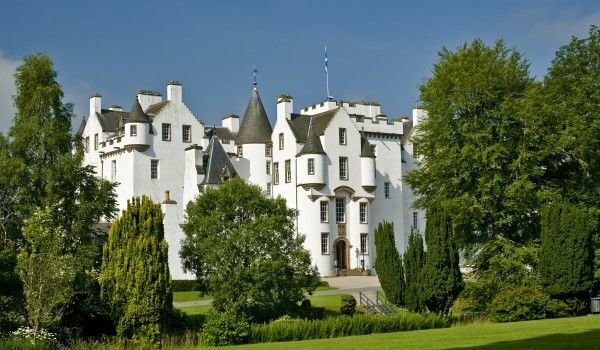 Apart from a small break during the war, Blair Castle has never stopped offering its visitors much fun and interesting history. According to some, the castle attracts more visitors than any other private palace in Scotland. Blair Castle can be defined as a magnificent mansion, which offers guests a wide range of facilities and services. Moreover you can also tour among 30 excellent and authentically furnished rooms, also you can celebrate your holiday, wedding or any other event in the excellent restaurant. The Visitor Centre organizes tours of the palace, during which they may have several exhibitions. They are spread across three floors of the castle. The last two have been assigned as official rooms and bedrooms. Particularly impressive are the Red and Blue bedrooms and the dining room which is distinguished by exquisite craftsmanship. In one of the halls of the castle you can view a large collection of china and cutlery. North of the castle, is Diana's Grove, where you can see some of the tallest trees in Britain. To the east you will find in the Hercules Garden, which covers an area of approx 9 acres around both banks of the picturesque lake. Within the castle complex you can visit the ruins of an old chapel Kirk named after St Bride's, when 12 centuries ago it was used as a place for pilgrimages. The construction of the church as it is, has remained until today and was most likely built in the 16th century. The original St Bride's Kirk existed on this mound during the "dark ages".